Life is full of changes of which may include a change in marital status. You may have gotten married or divorced. Regardless of which one, there are a few tax implications that you should keep in mind and make sure you have them completed in the year the change occurred. This may not be the case for every one as we start moving towards a society where individuals are increasingly keeping their own last name. However, if you take your spouses last name, hyphenated, or change back after a divorce, that information will be known by the IRS. They receive that information from the Social Security Administration. With that in mind, it is important to remember that the number one rule of tax returns is that the names on the return must match the record of the SSA. In a lot of cases, after marriage or divorce, one or both of you will most likely move from your current residence. It is important that if you do this to inform your tax preparer so that they may file the corresponding forms. If you prepare them yourselves, then the form needed to be filed is the 8822, Change of Address. All correspondence with the IRS is sent by mail to the most recent address on file. It could be a problem if you miss a CP2000 notice from the IRS because they will pursue it. It is important to remember that the filing status of your return needs to be changed. 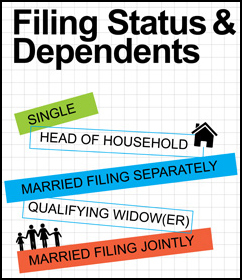 This can be either to Married Filing Jointly (MJF), Married Filing Separate (MFS), Single, or Head of Household (HOH). Each of these statuses carry their own special tax implications. That is why it is important to remember to choose the correct one. The goal of taxes and withholding is to generally get the amount withheld as close to the amount of tax owed as possible. Owing taxes is never fun (it can also incur penalties in some cases) and getting a tax refund may seem great, but it is money that was earned by you that was being held by another with any interest being gained. That is why it is important to change your withholding on a new W4 after the change in status. This is because single status and MJF status have different tax rates which may no longer apply to you and therefore create either an underpayment or over payment of taxes withheld. Taxpayers who get health insurance through the Marketplace should report any changes in circumstance to the Marketplace. Those marrying or divorcing who receive the advance premium tax credit should report their change in circumstances to the Health Insurance Marketplace to have their APTC properly adjusted to avoid getting a smaller refund or owning money when they file their return. Alimony that has been paid is allowed to be deducted on your return to reduce the Adjusted Gross Income whereas alimony that has been received is considered taxable income. This is important because it may reveal to you that a change in withholding amount should be made due to the alimony received or paid.